Fortunately, no explosive. But unfortunately, with all the threats now they have to worry. It came through a delivery service with no note and no information. FBI and Joint Terrorism Task Force are now investigating. 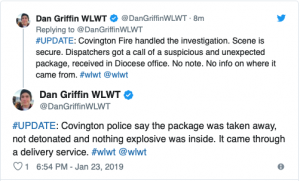 So maybe not explosive but it sounds like it was meant to terrorize.